And Joshua set up at Gilgal the twelve stones they had taken out of the Jordan. He said to the Israelits, “In the future when you descendants ask their parents, ‘What do these stones mean?’ tell them, ‘Israel crossed the Jordan on dry ground.’ For the Lord your God dried up the Jordan before you until you had crossed over. The Lord your God did to the Jordan what he had done to the Red Sea when he dried it up before us until we had crossed over. He did this so that all the peoples of the earth might know that the hand of the Lord is powerful and so that you might always fear the Lord your God. I’ve got some memorial stones of my own. There are both my kids’ adoption processes. Details in both reminded me God is faithful and always working, even when we can’t see what he’s doing. We found the ideal house for our growing family when we weren’t even looking and moved three weeks before our second child was born. Just yesterday I finished blogging about five ways Januarys in the past have changed my life. As a planner who has been known to resist change, God often reminds me how he has provided in the more than five years since I quit a job I loved when my daughter I loved more was 4 months old. I went back to work as a small-town newspaper reporter after six weeks at home with my newborn daughter. This was my plan, yet I was more reluctant than I expected. Still, I went, mostly because I told my boss I would. Plus I wanted to prove to myself I could do it all. I could be excellent at my job and be a devoted mother. Truth was, it was hard. And my girl wasn’t even moving yet. My husband worked at home in the mornings when I went to the office and then I came home at lunch and we swapped. He went to work and I took care of Cate while fielding phone calls and answering emails, possibly even writing my stories for the next day’s paper while she slept. I took her along to interviews at the sheriff’s department and city hall. It worked, but I knew it wasn’t going to work for long. Honestly, I didn’t want this arrangement to work for much longer. Greg had gone out on his own and started his own law practice in August 2006. Not even a year earlier. That was certainly a factor in my hesitation. I got paid every other week. Granted, newspaper reporting isn’t a lucrative profession, but my paychecks were steady. We knew what they would be and when they would come. And my health insurance contribution to my work’s group plan came out of that salary. I debated. I talked. I thought. I asked. I wondered. I worked. I mothered. I hesitated. And then I trusted God. In August 2007, just after my sister’s wedding weekend when God sealed my decision during a conversation with my aunt, I told my boss I was going to quit reporting on police and courts news, university and city government meetings and business, and our town’s publicly owned hospital. I was going to fully embrace motherhood now that my husband had figured out how to make health insurance work through his still young business. God has provided. He’s been faithful as my husband has worked to expand his business. I may have a print journalism degree, but God has opened up opportunities for me to use some of those same skills to volunteer with community organizations that matter to me and manage our two Kentucky Lake vacation rentals. Starting just a couple weeks after I quit my job, I went to a mom’s group where I met another stay-at-home mom who has become a dear friend. He’s helped me build friendships with other moms who help sustain me. And God has given me contentment. When I walked out of that newsroom for the last time on Sept. 14, 2007, I did wonder if I’d miss it. How could I not after four years of loving a job I had once said I’d never do? But somehow God gave me peace and took away that wondering and wishing and missing the organized chaos of a newsroom, an environment in which I thrived. My days at home — well, you know, we go places too — are harder than the ones in the newsroom, but I already get that they already are and will be more rewarding. I want to remember. I want to remember how I eventually trusted God in accepting change. I want to remember how God provides and is faithful and gives peace that passes all understanding. So here is my memorial stone for that decision that not only changed my life but has changed my husband’s and daughter’s life and more recently my son’s life. Last week, Holley encouraged us to take this step: Thing back to another time when you took positive action in your life. What’s one thing that helped you move forward that you could apply again now and someone else could benefit from hearing too? Remember. That’s my one thing. I cherish stories and love to reminisce. It’s in the words and memories that I’m reminded what God has done. I’m left believing he’ll do it again and again. Because the hand of the Lord is powerful. 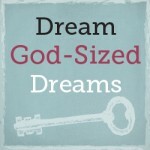 Tuesdays are God-sized Dream days around here and I’m linking this post along with many, many other dreamers on Holley Gerth’s blog. You’ll find encouragement, truth and community there. Want more? Subscribe to get “Insights” in your inbox. Or follow me on Twitter. Oh, wow! There is so much encouragement in your journey. And evident is your faithfulness to God and his faithfulness to you. Thank you for linking up at my place today. What a blessing to read! Thanks, Michele. I've enjoyed reading your blog. Yet another example of God going above and beyond the one thing I was concerned about and proving he's got it ALL under control!